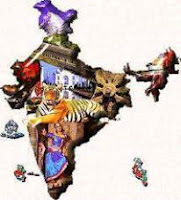 India GK Question Sample Paper 7: India General Knowledge (GK) Sample Question Paper No. 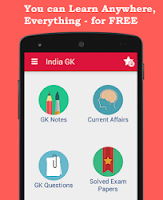 7 with Collection of India GK Questions under GK Quiz in PDF @ India GK Sample Papers. Q. 141. Azad Hind Fauj was founded in 1943 in ? Q. 142. In collaboration with Dravid hare and Alexander Duff, who of the following established Hindu College at Calcutta? Q. 143. Who of the following Prime Ministers sent Cripps Mission to India? Q. 144. With whose permission did the English set up their first factory in Surat? Q. 145. The language of discourses of Gautama Buddha was ? Q. 146. The title given by the British Government to Mahatma Gandhi which he surrendered during the non-cooperation movement was ? Q. 147. Under whose leadership was the all India Muslim League set up? Q. 148. Ashoka's Dhamma represented ? Q. 149. HUMAYUNAMA was written by ? Q. 150. "Kheda Satyagraha" was basically initiated by ?